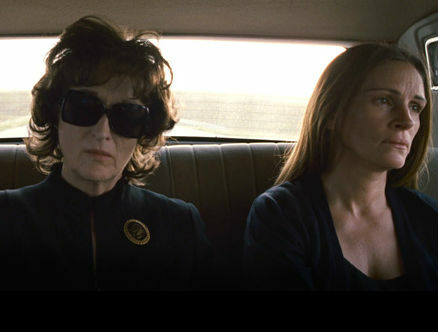 -First it was George Clooney, and now it’s Meryl Streep who skipped her TIFF premiere. She said it was due to “illness” but maybe she just didn’t want to see Julia Roberts after bumping her out of the Best Actress race. –Julia, meanwhile, played nice with Taylor Swift last night. –Kate Middleton eats at McDonalds, making me feel much better about this week’s TIFF diet of Red Bull and Tic-Tacs. -A blogger called 911 during a TIFF screening because someone was using their cell phone in the theatre. Strangely, I can kind of relate. -Meanwhile, some guy who looks like James Franco has been getting into TIFF parties by pretending to be him. I already had my close encounter with Franco, and I think one of those in town is enough. -Also, Franco says he wishes he were gay. –Angelina Jolie got a big tattoo in Arabic so now everyone’s confused. -Fox put The Mindy Project’s season premiere online a week before its debut, and critics are raving about how much the show has improved. -I missed the Toronto screening of the new Agents of S.H.I.E.L.D. pilot, but my TV critic friends who saw it thought it was “meh.” Rumours that Joss Whedon is doing frantic rewrites on subsequent episodes doesn’t bode well, either. -Even a Gossip Girl reunion couldn’t cheer up Sad Panda. –Blake Lively and Ryan Reynolds celebrated their first anniversary with a down-home southern meal that cost a grand total of $36. This story makes me kind of like them, and that confuses and scares me. –Here’s a clip from one of Cory Monteith‘s final roles. –Patrick Stewart and Sunny Ozell got married, and Ian McKellen officiated the ceremony. Zoinks! -Jimmy Kimmel revealed that he was really behind that “Worst Twerk Fail Ever” viral video. –Oprah may be the queen of everything, but she’s still scared of balloons. -I don’t like this photo of Penn Badgley making out with Dakota Fanning. I don’t like it at all! –Emma Watson just landed the lead in the adaptation of Your Voice In My Head, which means I’m going to have to finally finish that book, I guess. –Miley Cyrus is getting some support from Britney Spears on her new album. If only she could get some support from a bra, amiright? –Howard Stern and Robin Quivers told their listeners yesterday that Robin’s been undergoing chemo for the last 15 months. -My buddy’s hilarious TIFF gallery just got called out on Buzzfeed! –Demi Lovato just signed a two-book deal, which I’m not even going to snark on because I think that kid is pretty damn great. –Ashton Kutcher and Demi Moore are clearly back on civil terms. -Leah Remini continues to talk smack about Scientology because she’s amazing. -What, Naomi Watts? I mean seriously — what?!!??? –Chloë Grace Moretz has come out in support of her two gay brothers. -A movie that is started to pick up serious buzz at TIFF is The Railway Man, starring Colin Firth and Nicole Kidman. Here’s the first trailer.